As equine veterinarians we see a large variety of horses, and we get to be involved in all aspects of horse health and wellness. An important part of that is dentistry. All vets are trained to properly and effectively perform a dental exam and float, however we all have areas of veterinary medicine that we enjoy more than others, so not all vets enjoy dentistry like I do. To be clear, I’m not a specialist, I am not board certified in dentistry, this is just a part of my day that I look forward to every time. I suppose part of it is the instant results. 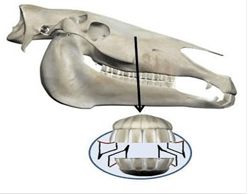 You can take a horse with painful sharp points in its mouth and 20 minutes later they have relief! I had braces as a kid and I can tell you that sharp points cutting into your lips and the side of your mouth are awful. They are painful when you eat and I certainly wouldn’t have been happy with someone putting a bit in my mouth and asking me to work. Horses form sharp enamel points due to the shape of their jaw and the grinding motion they use. The lower jaw is narrower than the upper jaw, therefore the outside of the upper jaw and the inside of the lower jaw never grind against another tooth. Over time this develops into points that can rub along the sides of the tongue and against the cheeks. Sometimes these points are sharp enough to cut the latex gloves that we wear while we exam the mouth. Ouch! When I see those points and the ulcers associated with them I actually smile – I am about to make this horse’s life so much better! It is also an opportunity to provide education on the need for routine dentistry. If you are present, I have a chance to let you feel what is going on inside the horse’s mouth for yourself. Even in mild cases, when I find ulcers, or irritation within the mouth I will ask if you have had trouble with the horse on one rein, or the other and more often than not you realize that the horse has been uncomfortable in the bit on the same side as the ulcers. Young horses losing their baby teeth are a special joy for me too. 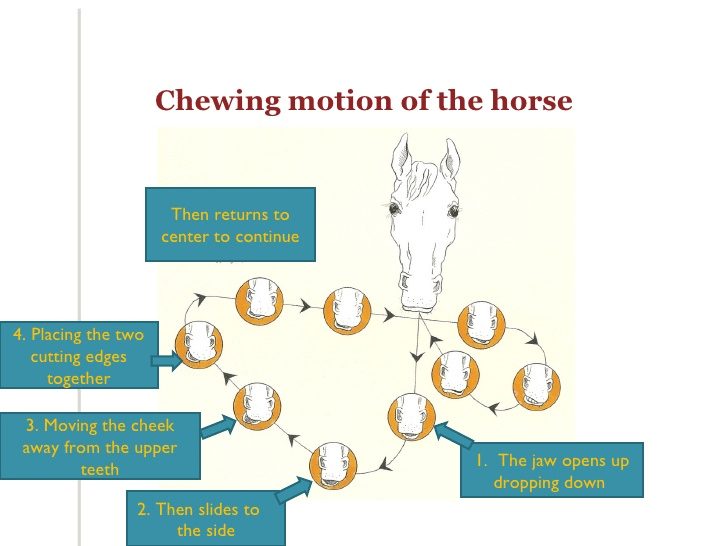 Usually these horses are chewing in a strange way, dropping feed, throwing their head – sometimes even drooling. 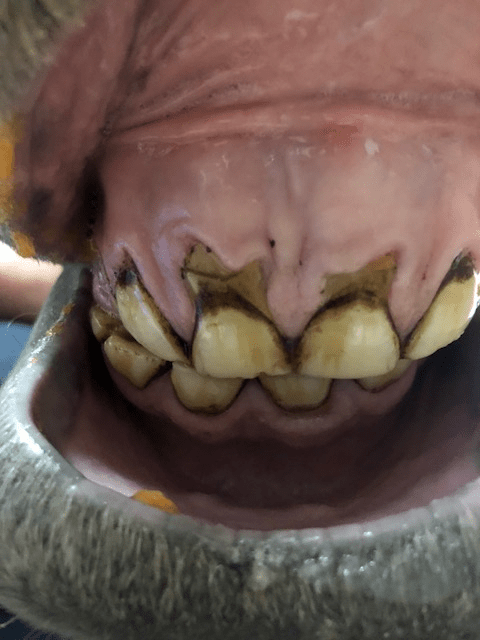 When I get the horse in the speculum, and open the mouth – there is a loose baby tooth just asking to be pulled out! Remember being a kid, when you would spend all day wiggling a loose tooth until it came out? The feeling of your tooth moving every time you took a bite was so annoying. Young horses experience the same thing and we can provide instant relief by playing “big-brother” and pulling that loose baby tooth. Another reason that I love dentistry? The horses are usually healthy. This is a selfish one. We see sick horses frequently and it makes us sad. I became a vet because I love horses. Seeing them in distress can be hard for the soul, even though I am happy to have the opportunity to help. Dentistry provides a nice break from the emotional cases. The horse is happy and healthy, we sedate him, perform a dental float, and then he wakes up even happier and healthier! Everyone wins! I’ll be honest; it isn’t all sunshine and rainbows. 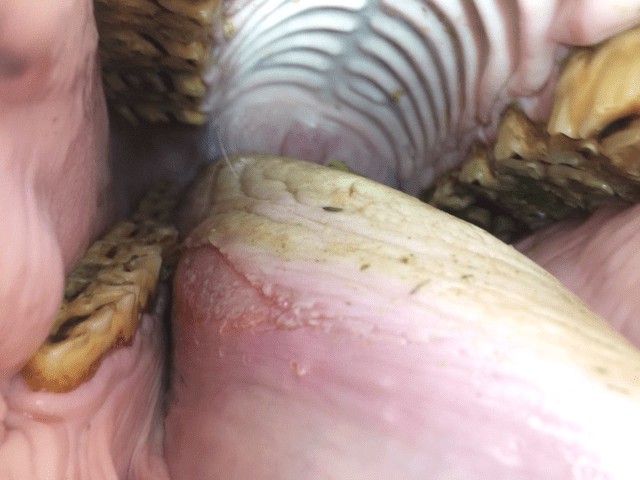 There are few things more disgusting than the smell of rotting tooth. When an infection takes hold of a tooth it can cause some pretty terrible nasal discharge or drainage under the jaw. It is gross and I don’t know anybody that likes that part of dentistry. When you extract those teeth in surgery you usually need to go have a shower immediately because somehow the smell just sticks to your hair and clothes. 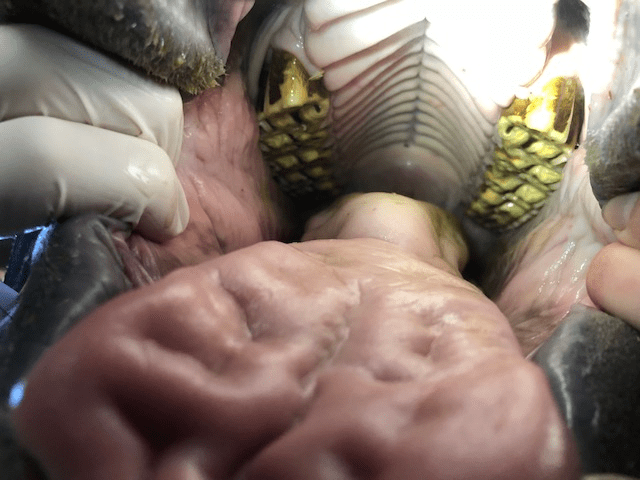 Dentistry is a fun puzzle – how does the horse chew? What is impairing normal grinding and causing any abnormalities? Could problems in the mouth relate to performance or overall health? How is it fixed without taking too much of the limited grinding surface? Dentistry might not be everyone’s favourite part of their day, but I bet if you asked, any horse vet would admit that they do love some parts of it! All vets love how we can make such a quick and positive impact on the health of our patients. This entry was posted in Reflecting with Dr. Markey and tagged caledon, dentistry, dvm, equine, marisa markey, ontario, veterinarian. Bookmark the permalink.